This ceremonial bull was the centerpiece of the festival. As they say here in Mysore, Happy Sankranthi or Harvest Festival. Also known as “Pongol” this four day festival is the equivalent of Thanksgiving in other countries. It is a celebration of thanks given after the rice harvest and the festival celebrates the sun, rain, and farm animals that have helped to create another bountiful harvest in the southern states of Tamil Nadu and Karnataka. The festival is celebrated from the 14-18th of January. 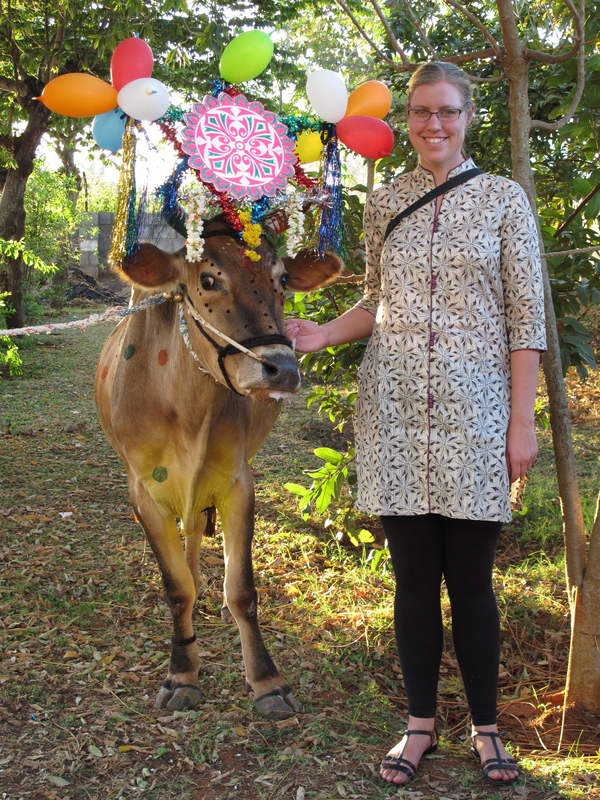 Colorful cows eat ceremonial offerings of rice and raw sugar outside of people’s houses. The second day of the festival is considered the most important day. It is the day to thank cattle for all the gifts they give people, which in India is an extensive list. Cows provide milk, which for traditional Hindus is the only animal protein that they will eat, mainly in the form of dahi (yogurt) or paneer (farmer’s cheese). 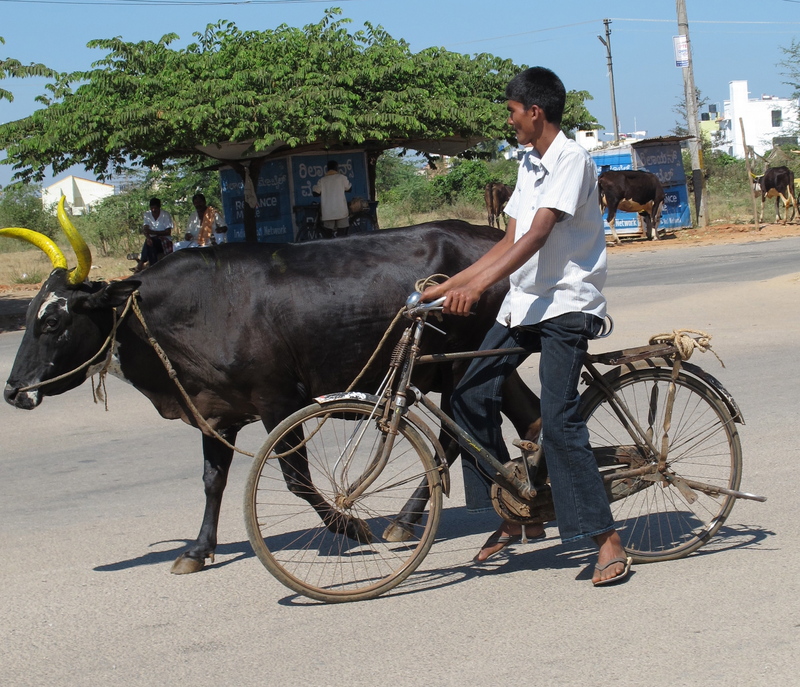 To this day oxen plow the fields and continue to pull bullock carts, which have been a long-standing form of transportation for people and goods throughout India. 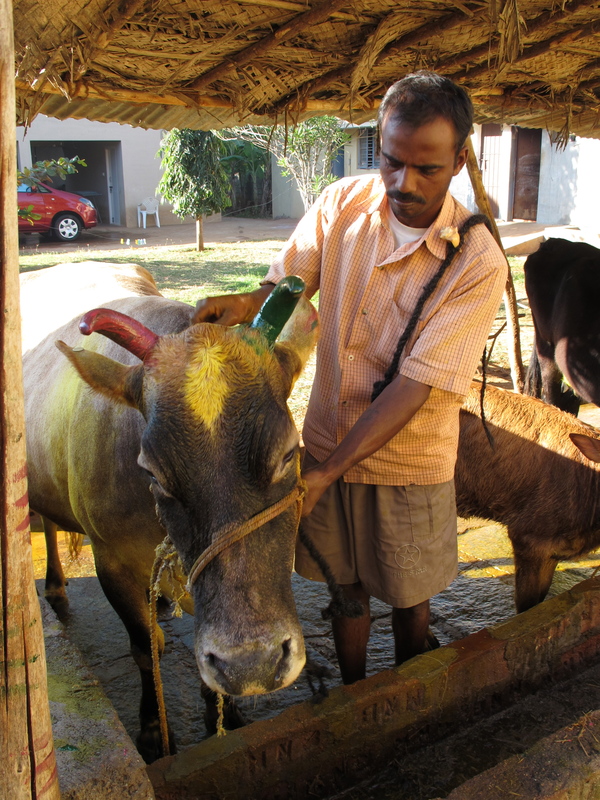 Cow urine and manure are used as effective fertilizers and natural pesticides. 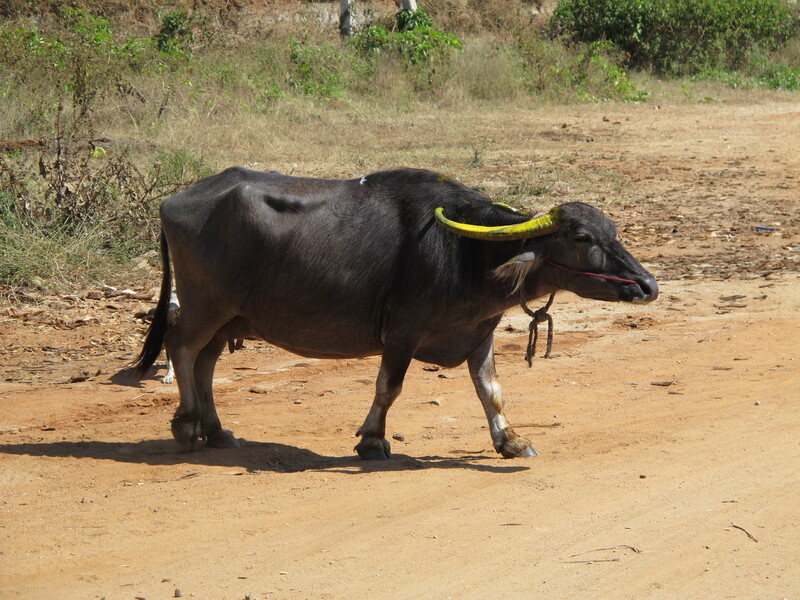 In some parts of India the urine and manure of native cattle is even used to make medicinal products for humans, like urine tonics and soaps and cow dung “digestives.” Also, after a cow has died (preferably a natural death) its hide is used to make leather products like shoes, belts, and wallets. In India, people continue to live closely with cattle and even with the changes that have occurred as India becomes increasingly modern, in rural areas of India, cows still have a prominent role in the day-to-day lives of many Indians. 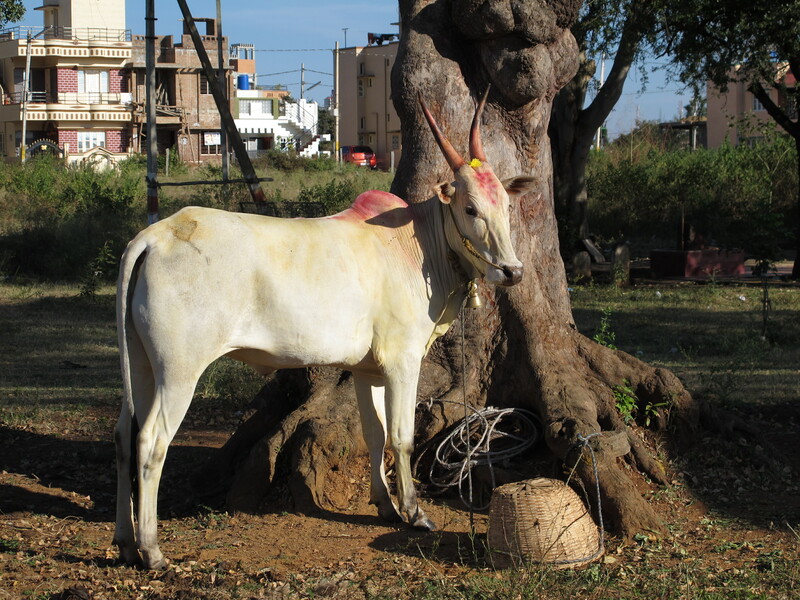 A native bull decorated for the festival standing outside the Nandi Bull temple in Kanakanasa Nagar, Mysore city. The neighborhood Nandi Bull temple. 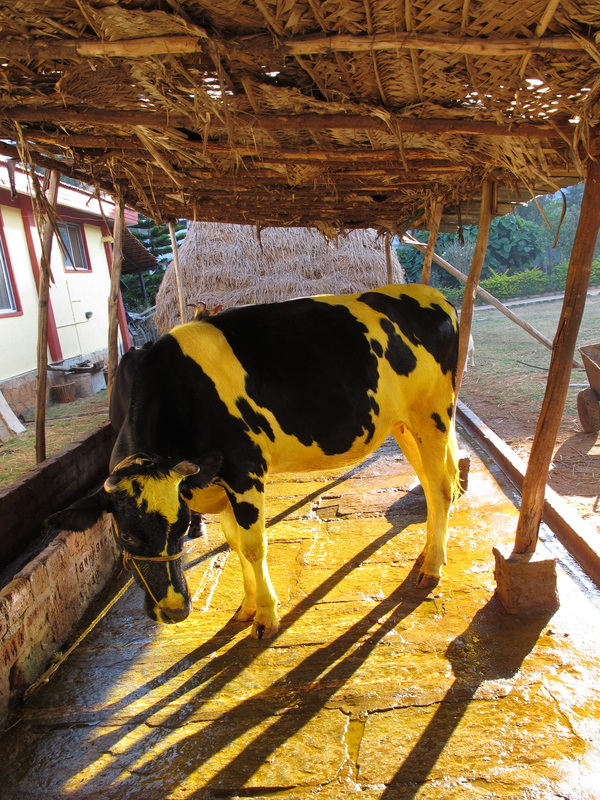 To start the festivities the cows are bathed with turmeric water in the early morning, which turns any white or light colored parts of the cow an intense shade of yellow. Then their horns are painted bright colors and sometimes decorated with ribbons or decorative metal caps on the ends of their horns. The cows then go about their day until afternoon. 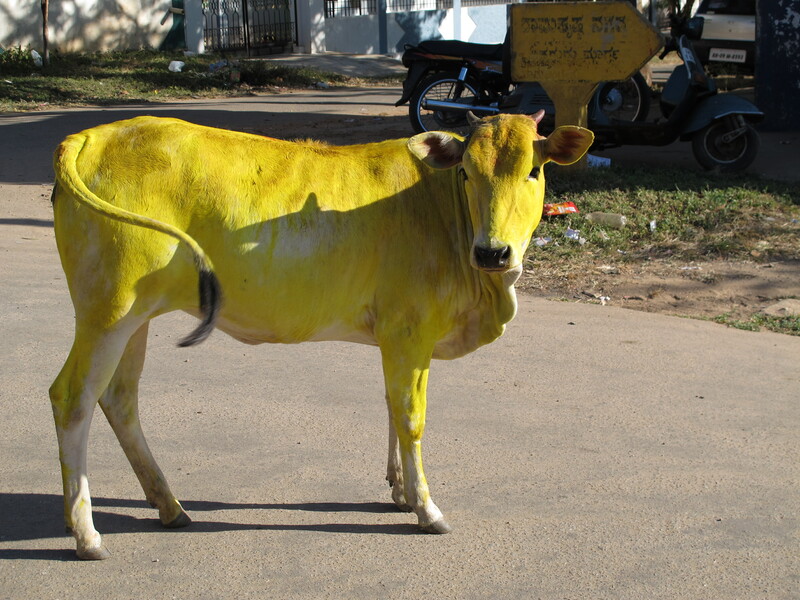 I took the scooter into town to look for decorated cows and found several cows wandering the streets, some of them eating out of stainless steel bowls filled with cooked rice or jaggery (unprocessed raw sugar). 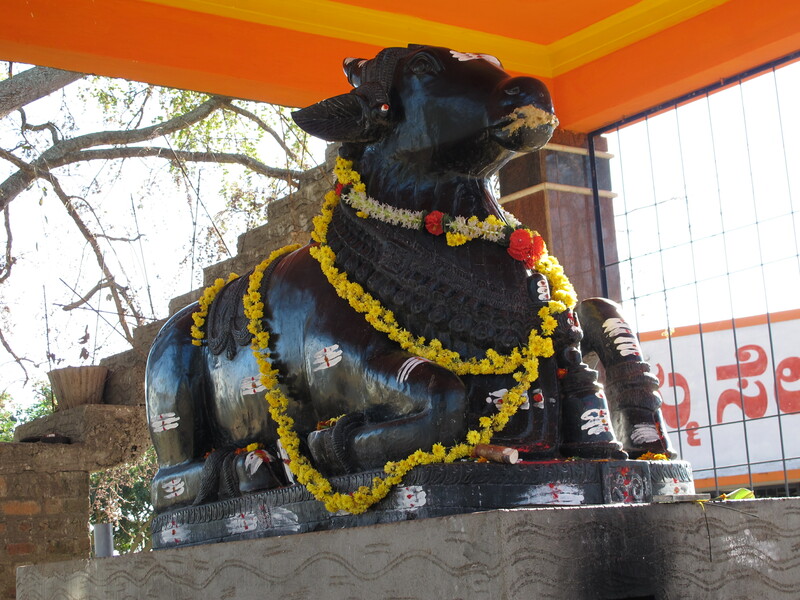 The Nandi Bull temple near the clinic was also brightly decorated with flower wreaths draped around the statue and ceremonial sandalwood paste covering its mouth. 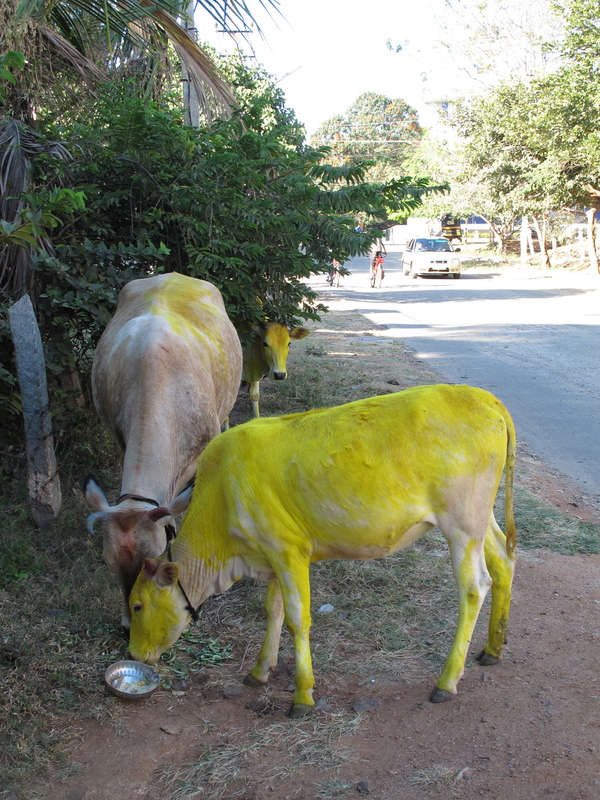 The turmeric water turned more than just the cows yellow. Mandahout, who manages the herd, makes painting cow horns look easy. In town the cows looked clean and colorful. This young cow and I shared a mutual fascination with one another. This cow was sitting outside our house. Even some water buffalo look more colorful than normal. It is during the evening that the real festivities begin. 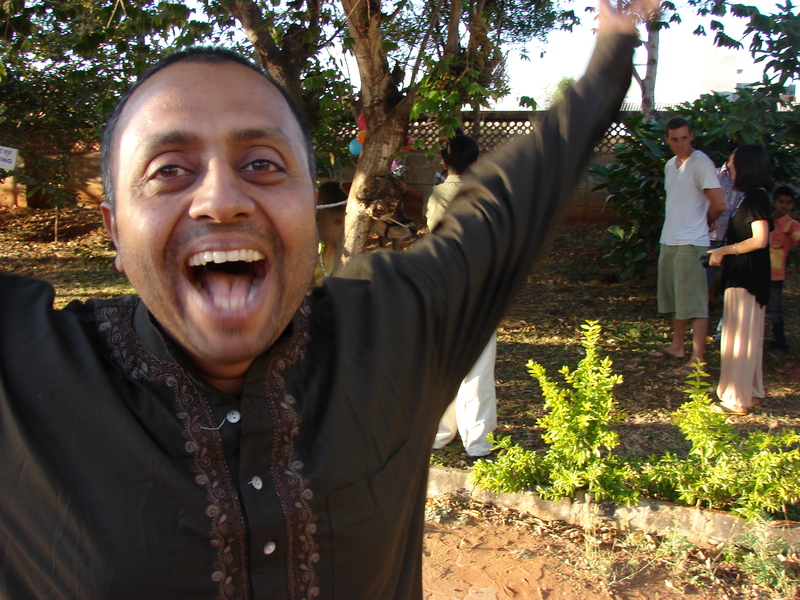 I was tempted to go to Mysore Palace where hundreds of people brought their cows to participate in the festivities, but I celebrated the Sankranthi party with Dr. Jag and his friends and family at his home in Mysore. He has five cows and two calves in his personal herd. 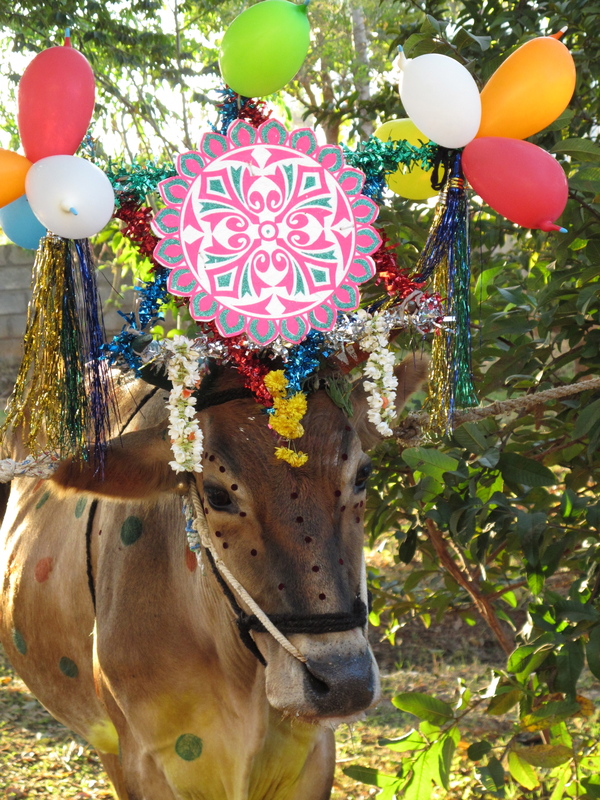 A ceremonial bull from the Maharaja’s herd was brought over and was ornamented with a crown decorated with several balloons. While everyone was visiting and taking photos, several rows of dried grass were laid out in the clinic’s parking lot and driveway leading to Dr. Jag’s house. After the grass had been arranged the cows were brought into the parking lot, some of them breaking loose and running at the crowd causing us to grab children off the ground and scatter. The real excitement began once the rows of hay were lit on fire. Now it was time for the cows to jump over the fire. 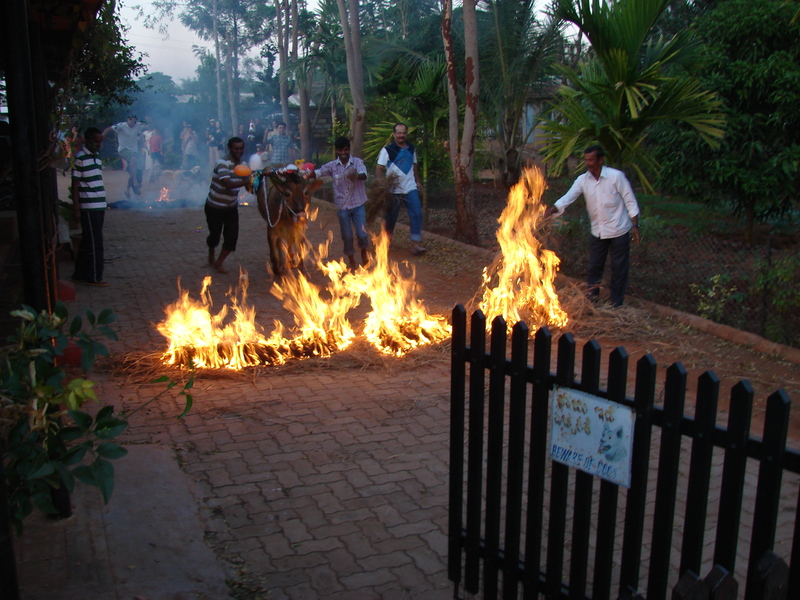 All at once, everyone holding a cow, started running toward the fire, dragging the cows by their halters. 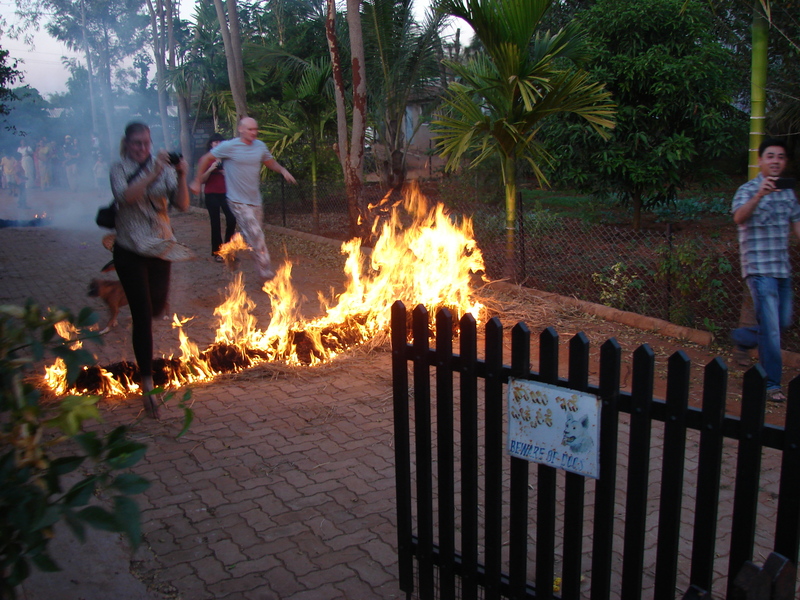 The cows, naturally, were resistant to the idea, but several more people ran behind the cows until cows and people alike were jumping over the rows of fire. 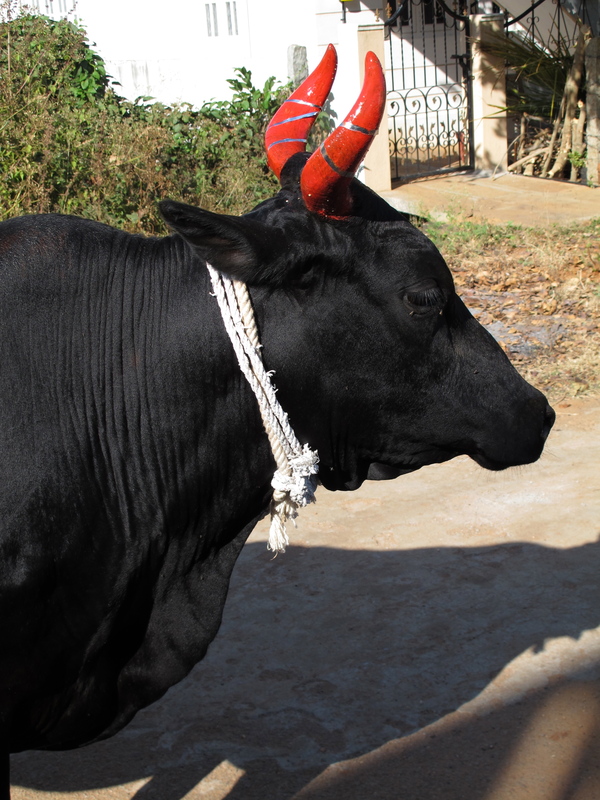 The ceremonial bull with his crazy balloon crown brought up the rear of the herd. The crowed happily trailed behind the cows, jumping over the five or so smoldering piles of hay that led to the house. 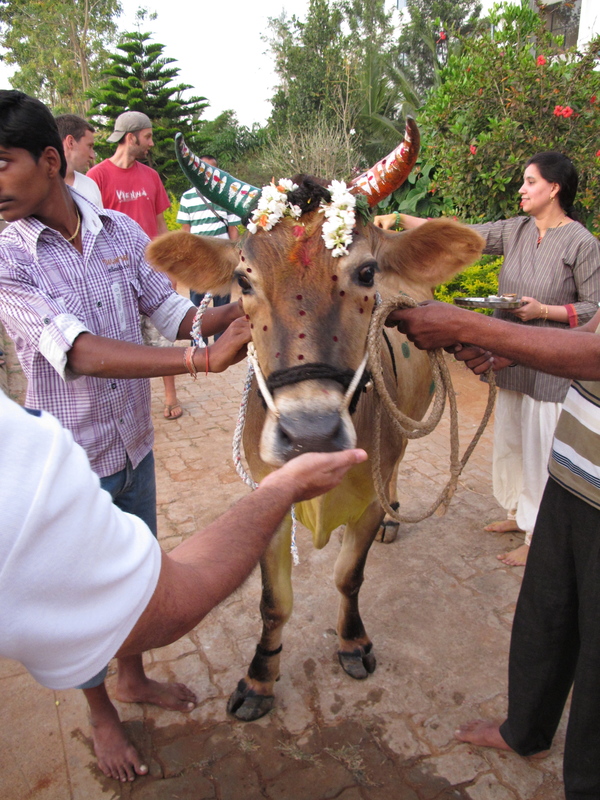 Once everyone had gathered in the courtyard a ceremonial “pooja” or blessing ceremony for the cows were performed. 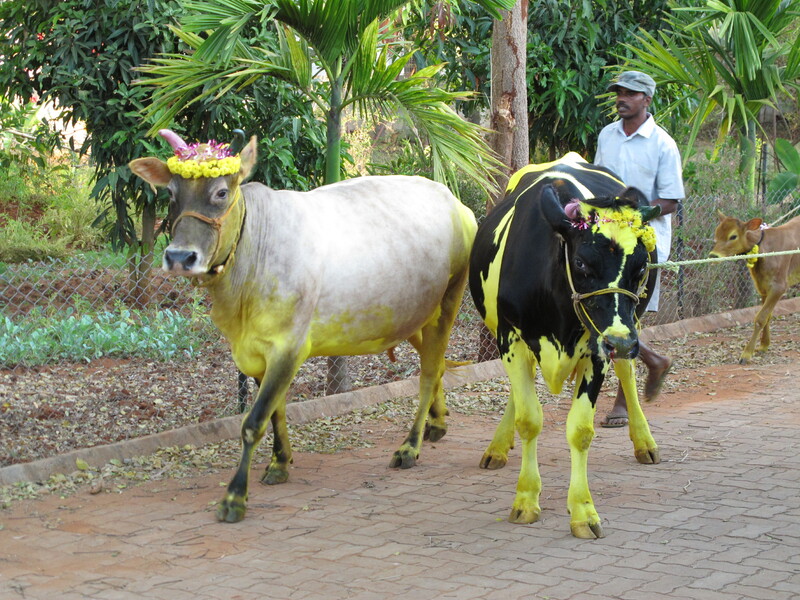 Cows were given red and yellow paint marks on their foreheads, rice and flowers were sprinkled on their polls, and they were given plates full of cooked rice, jaggery, and coconut. Then we were invited into the home where there was a pooja for the children followed by a delicious meal of traditional South Indian dishes. After the party guests were given short stalks of sugar cane, a banana, and a bag of sweets on their way out the door, to sweeten our memories of the day. It was hard to resist a photo op with this bull. And some silly ones too. After I took this photo, the brown Swiss cow on the left charged the crowd. Jumping over the final row of fire. 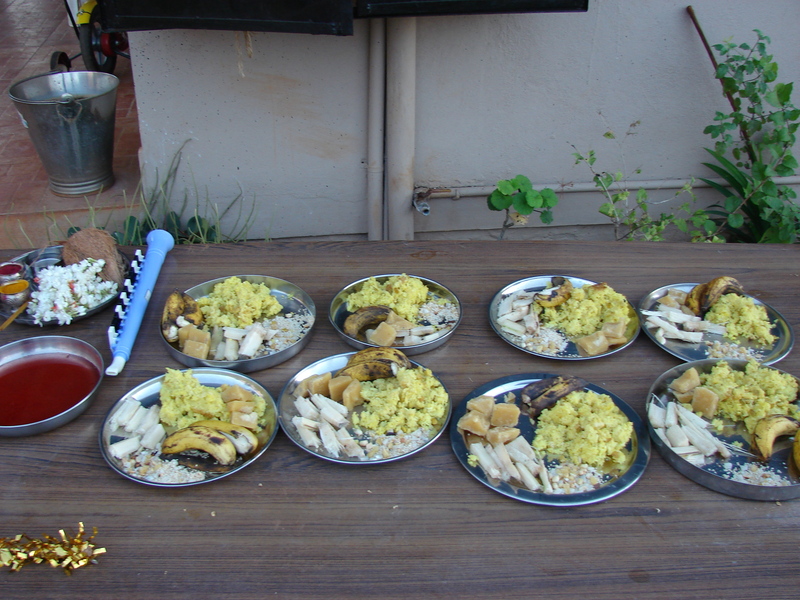 The plates of food set out for the cow pooja. The bull was hand-fed his rice and sugar. The way that cows are given thanks during this colorful and sometimes chaotic festival, may seem very strange, but there are simple and practical explanations for most of the ceremonies performed. 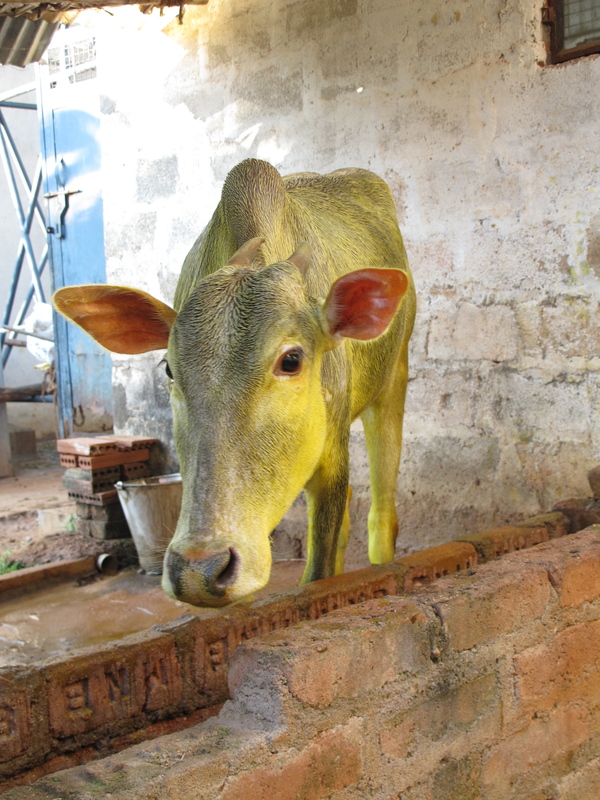 The cows are bathed in turmeric water because turmeric has antimicrobial properties and it helps to treat any skin diseases before the summer temperatures start to climb. The horns, and sometimes the hooves, are painted because the paint acts as a fly repellent. And the cows are led across the rows of fire so the heat from the fire kills any ticks or flies eggs that have attached themselves to the cow’s legs. I was told the balloon crown, which was the piece de resistance of the day, does not have any meaning behind it, but was merely for decoration. I would disagree. 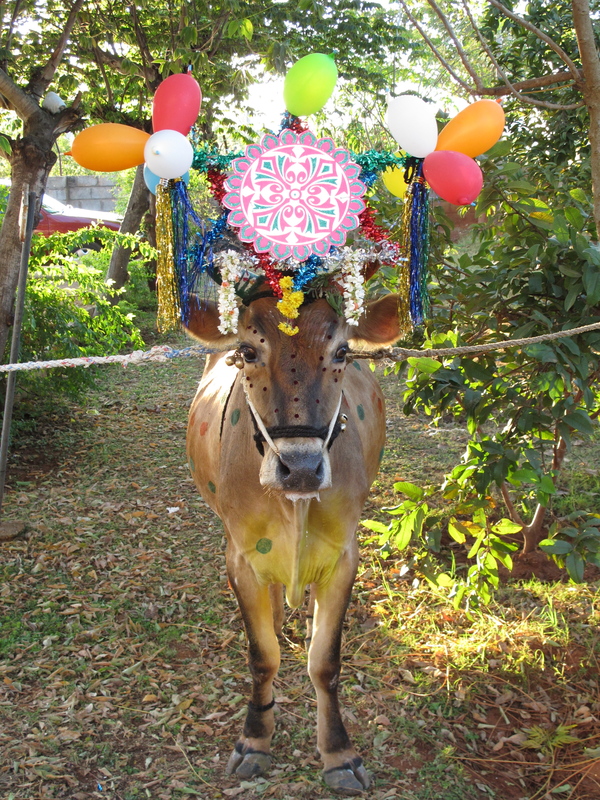 The bull was the centerpiece of the party and that wild headpiece, put the festive in festival. At the end of the day I was happy to discover that Thanksgiving is truly my favorite holiday in any country. 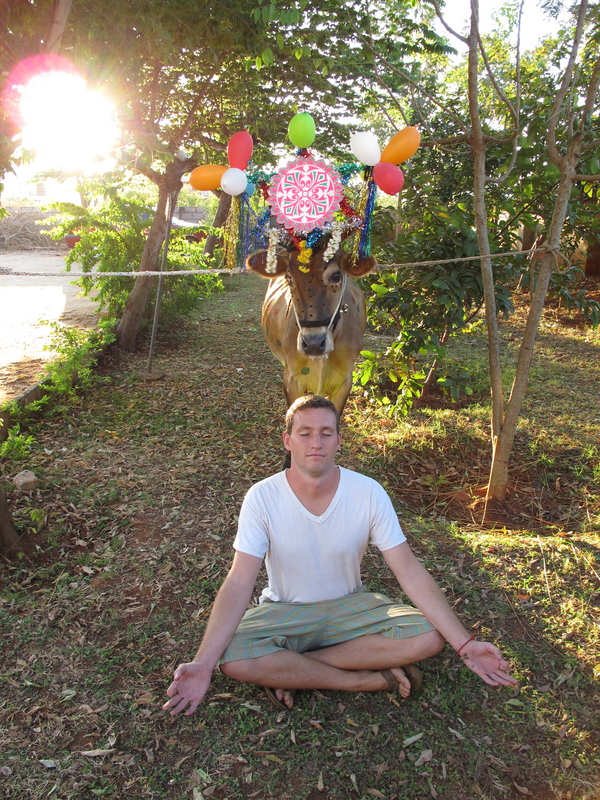 This entry was posted in India and tagged Cattle, Festivals, Hinduism, India, Travel. Bookmark the permalink. I use a wordpress as my server. You can find out more about the server at http://www.wordpress.com. Best of luck to you.